For this, and all kinds of homework help, visit me at http://www.enotes.com/people/herappleness and also hundreds of awesome educators ready to answer your questions in science, lit, math, you name it! Hawthorne definitely shows scorn toward the women of the village, hinting in a succinctly satirical tone, which is typical Hawthorne fashion, at their lack of sophistication, their excess weight, their coarse faces, and their petty attitudes. This direct characterization is done to contrast them completely against his main character and heroine of the novel Hester Prynne, who is supposed to represent the absolutely opposite of what those women do. He already suggests in chapter 2 that the women wanted to draw the proverbial blood out of Hester, as she was on her way to the scaffold to submit to public humiliation. …on the summer morning when our story begins its course, […] the women, of whom there were several in the crowd, appeared to take a peculiar interest in whatever penal infliction might be expected to ensue. The […] sun[..]shone on broad shoulders and well-developed busts, and onround and ruddy cheeks, that had ripened in the far-off island, and had hardly yet grown paler or thinner in the atmosphere of New England. Again, this was Hawthorne’s quiet sense of humor, openly showing that the women would have clearly been jealous of Hester, more so than appalled by her behavior. Could it be that they secretly wished to have the gumption to do as they wish? Could she represent their repressed sexuality, if applicable? Are they mad because they suspect that any of their husbands could have been the culprit that impregnated this beautifully different woman from England? That is what it seems like, considering the words that they used. There were children there, too. They were given a half day off school to attend the public humiliation of Hester at the scaffold. They, along with both men and women, were amazed at the dignity with which Hester wore her scarlet letter. All of them admitted that her talent with the letter was so good that it looked more like a symbol of pride than one of shame. under the heavy weight of a thousand unrelenting eyes, all fastened upon her, and concentrated at her bosom. It was almost intolerable to be borne. Therefore, a combination of petty, anger, and awe was in the air. 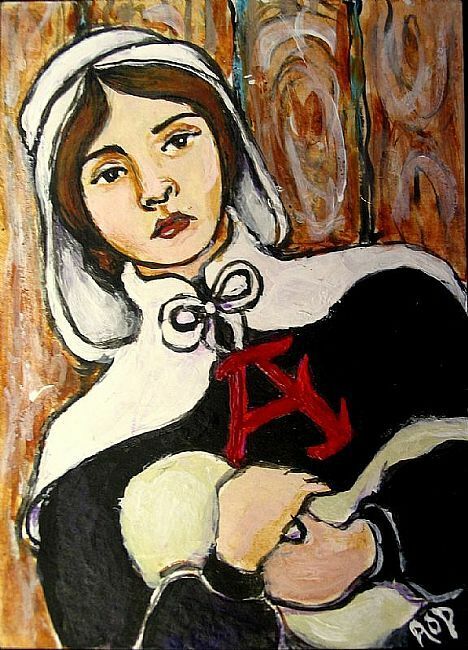 All was caused by Hester Prynne, her baby, and her scarlet letter. It is all a collage of emotions that are caused in society when a pariah is identified. Such is the case with Hester Prynne.